Methodism’s Christmas Conference December 24, 1784. In his 1989 landmark work, The Democratization of American Christianity, Nathan Hatch, Professor of history at the University of Notre Dame, examined the spread of Christianity in early America, arguing that the groups that flourished were the ones that were able to fuse Christianity with America’s emerging democratic form of government. Among the many early groups, no group surpassed the Methodists when it came to absorbing American style democracy. 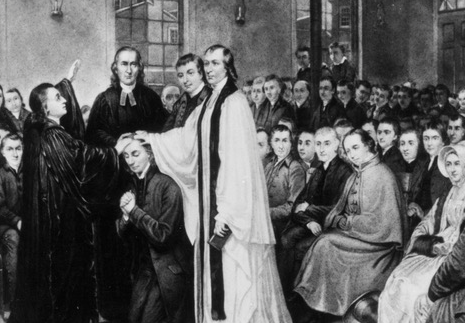 Indeed, by the mid-nineteenth century, Methodism would emerge as a religion of the people and by the people, the quintessential form of American Christianity. To be sure, it would take decades for Methodists to perfect their democratic sensibilities. African-American Methodist and Wesleyan-holiness denominations exist today in part because the Methodist Church was not always hospitable to blacks, to women, and to the poor. Nevertheless, if we take the Methodist tradition as a whole, which is to say, if we include these other Wesleyan churches, then American Methodism is a deeply democratic form of religion. It doesn’t simply insist that all people are welcome at the table. Rather, American Methodism insists that all members’ voices be heard, whether from the pulpit, through direct vote, or by representation, and we live with the results. As represented by Bishop Bruce Ough, the United Methodist Council of Bishops’ decision to recommend only one proposal to the upcoming special called General Conference is deeply anti-American Methodist in spirit. Granted, Bishop Ough and the Council of Bishops did not suggest that those elected to represent the people not be allowed to vote. But the decision to allow only one of three proposals stemming from the work of the Commission on a Way Forward coupled with the decision not to allow any proposals to be brought by the delegates themselves is no less stifling with respect to the voices and concerns of the people. to consider multiple proposals, ranging from proposals regarded as “far right,” to centrist and “far left” or progressive proposals. Moreover, I will respect the outcome of the conference, regardless of which proposal triumphs. That comes with democracy. By contrast, Bishop Ough’s proposal on behalf of the Council of Bishops preempts all of this. It implies that we the people (through our duly elected representatives) cannot be trusted to think for ourselves; that we are not capable of considering three clear and distinct proposals or of bringing intelligent proposals of our own. It is condescending and offensive in the extreme, and it violates the spirit of American Methodism. 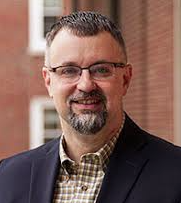 Jason Vickers is Professor of Theology at Asbury Theological Seminary, Wilmore, Kentucky. He is the author or editor of numerous books, including The Cambridge Companion to American Methodism. Since this isn’t class and I am not being graded, I am going to leave it with an “Amen, Brother”. I said this afternoon that apportionments are “taxation without representation”. My pastor recommended my reading your article. Democracy is fine, but the real issue is, What does God think about this?” This whole experience is so fleshly that it invokes some of the strongest warnings in scripture – warnings in Jude about false teachers, for example. We should be dealing with this through prayer, fasting and seeking the Lord – not by political posturing and votes. Is the Lord’s arm too short? Methodism as Wesley taught and the current watered down “Christian” teachings are barely related. I think that Methodist leadership and pastors have been to focused on being appealing to the times and not focused enough on the old style of Methodist “method” for lack of a better word. Upon baptism or declaration that Jesus is ones savior, where does one go? John Wesley and his contemporaries has the idea that a Christian can grow into a full sanctification over time. This naturally means that sin must be removed and replaced with holy living. In The Church of The Nazarene, they still teach this progress and process to entire sanctification. It seems like Methodist pastors in the UMC are more focused on loss limitation of both members and funds rather than teaching Methodist theology and letting those who don’t like it move on while retaining the ones who do. This of course would require replicating the ones who stay to take the place of the ones who leave. At the end of the process, a faithful group of Methodists will occupy the church while the ones who didn’t want real Methodism as it was taught in the18th and 19th century can find some other church. Perhaps the Episcopal church might be a good place for these non Methodists who are members of The UMC. With old time Methodist teaching in place, the UMC could compete with the many Bible Churches and other evangelical movements. However the Methodist “method” is more regimented and prescribed than what some of the evangelical movements are. Methodism is a great way to build a Christian life, I wish the UMC would focus on it rather than catering to those who want the church to be more worldly. Leadership–locally and across the denomination–are so focused on “saving the church” they ignore the person in the pew and that is a dangerous thing to do. 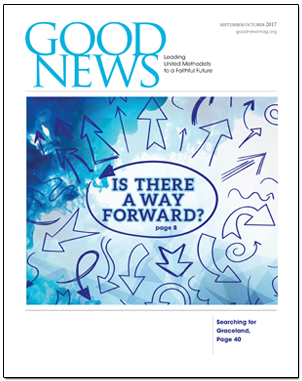 But then for decades, the American branch of The United Methodist Church has lost sight that Christianity–especially Christianity of the Methodist/Wesleyan persuasion–is all about individuals flourishing and thriving regardless of their circumstances because they are in right relationship with their Triune Creator God. Another way to state it is the starting point of Christianity is not about us “fixing the world” but about God fixing us as individuals. John Wesley did not save his part of the world through social justice initiatives. No matter what else he did, Wesley never ever waivered from his Priority # : the individual and their relationship to and with God. And I am a pew person who did what few have done, spent time with the writings of John Wesley in an attempt to clear up the confusion of what it means to be a Christian of the Methodist persuasion. And it is even better than I anticipated. And I literally followed in John Wesley’s footsteps and crisscrossed denominational lines to find adequate teaching that would help me understand who God is and who I am in relation. I was tired of the randomness of understanding I had accumulated after a lifetime of being a loyal Methodist/United Methodist. Almost all published dialogue from Mr Ough on this matter revealed his true position no matter how hard he tried to manage it. He has been firmly in the liberal camp throughout his presidency of the COB. And, the new president, Mr Carter, appears to be firmly in that camp as well. One of the great phenomenons of the modern UMC is how these people captured control of the UMC hierarchy. How in the world did this happen? Carter is very progressive. He has assigned a Lesbian associate pastor to my church. William, the church’s leadership has become liberal over the past 75 years because our seminaries moved in that direction early in the 20th century (along with all the other mainline denominations) and they have been training our pastors in liberal theology/ies. These liberal pastors are leading our churches, and in many places have been successful (over time and over successive liberal appointments)in leading a significant (though I believe a minority) percentage of our laity into liberal thinking and lifestyles. Also, many pastors who are evangelical/ orthodox / Wesleyan at heart would rather serve in the local church than invest their lives in conference or national church politics. Therefore, liberals move into these positions of influence and have shifted the direction and focus of the church (and it’s ministries and monies). It is truly miraculous (the work of the Holy Spirit, I believe) that we haven’t already completely lost the UMC. However, the UMC as a denomination may be nearing it’s final days. We’ll see how God carries us through this final conflict over theology and human sexuality. Since when is the Methodist church democratic? The only time I’ve been able to vote on leadership is when I was in leadership myself. The lack of democratic structure is part of the problem allowing a group of elites, betters, to dictate to the rest of the membership. My ultimate vote was when I walked away. Bishop’s job is to lead the church in following Bible, Book of Discipline and church tradition. ut Ough refuses all three. He needs to turn in resignation. Thank you professor Vickers for that insight. Just another reasonable argument set aside by our leadership that confirms their wayward ways. Onward!